(TibetanReview.net, Sep04, 2014) – The exile Tibetan administration at Dharamshala, India, is to invite Nobel Peace laureates from across the world on Mahatma Gandhi’s 145th birthday of Oct 2 as a part of a series of functions to mark 2014 as “the year of His Holiness the Great 14th Dalai Lama”. An announcement of this was made in his official speech by the head of the administration, Sikyong Lobsang Sangay, at a function at Dharamshala, marking the 54th Tibetan Democracy Day. The Sikyong called the Dalai Lama’s “gift” of democracy to the Tibetan people the second most important transformative experience in Tibet’s history, after the introduction of Buddhism in Tibet a millennia ago. He emphasized the need for strengthening the democratic institutions in exile as a means to “effectively support our political struggle” while repeatedly calling for “civility” in exercising one’s democratic rights. He called “the Middle Way Approach of His Holiness the Dalai Lama … the only way forward to resolve Tibet issue”, calling it “a win-win proposition to both sides”. In his speech, the Speaker of the Tibetan Parliament in Exile, Mr Penpa Tsering, called Tibet an independent country since the earliest period of human civilization and repeated the Sikyong’s call for a middle way solution on the issue. He regretted, however, that China not only refuses to solve the issue but also keeps repeating its “false accusations and fabricated allegations” against what it calls “separatists”, “reactionary Dalai government”, and so on. The chief guest for the function, which was held on the Tsuglakhang courtyard, was Mr Ravi Thakur, a member of the Himachal Pradesh state Legislative Assembly and Chairman of the Government of India’s National Commission for Scheduled Tribes. 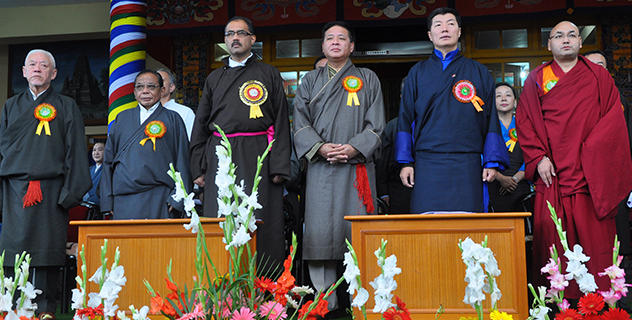 Awards were presented to Tibetans who had achieved academic distinctions during the year. Meanwhile, while expressing great sadness over the continuing tragic situation in Tibet, the Dalai Lama, Tibet’s spiritual leader who relinquished his historical temporal power in 2011, has expressed optimism that he will be able to return to Tibet. China today under President Xi Jinping has “not much choice, but to accept some liberalisation in political field,” he has said in an interview with the sbs.com.au Sep 3.